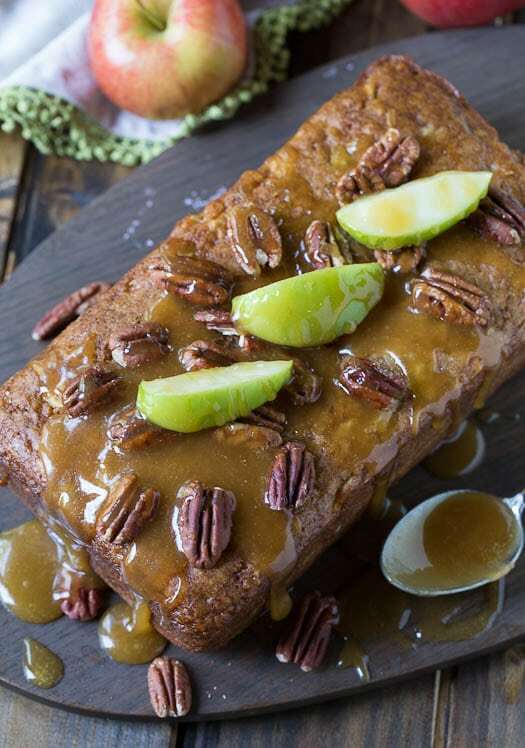 Caramel Apple Bread is a moist, delicious quick bread topped with a sugary caramel glaze and toasted pecans. 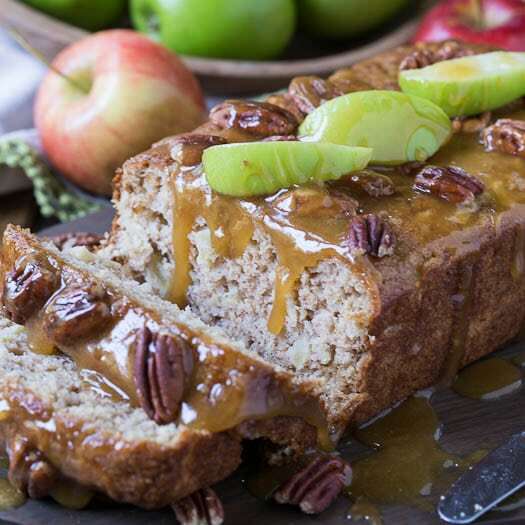 There’s nothing like fall baking, whether it be apples, pumpkin, or sweet potatoes. And there’s no better smell than cinnamon, brown sugar, nutmeg, and ginger emanating from the oven. Last year I was on a pumpkin kick, but this year I am really feeling partial to apples. It may not feel like fall yet, but put a loaf of this dessert bread in your oven and it will smell like fall. We have had some of the hottest weather of summer this last week and I am ready for it to be gone. That thick, oppressive heat that immediately drains your energy and makes you feel like taking a nap is not only a good idea, but a necessity. I almost feel like I’m back in New Orleans again. I’ve been baking fall treat after fall treat in the hopes summer will exit faster and let fall make its grand entrance. It hasn’t worked yet. But we have at least enjoyed the taste of fall. 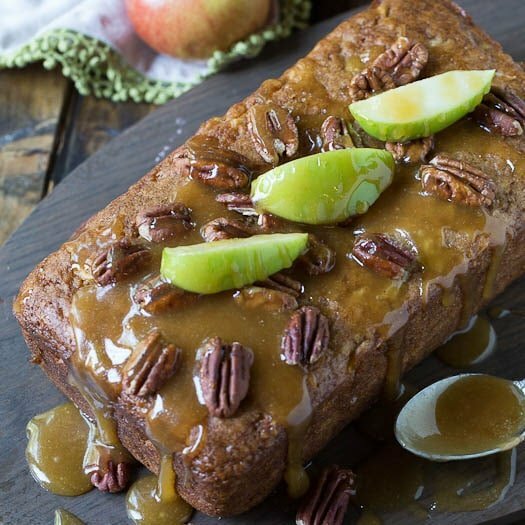 Caramel Apple Bread is moist and dense with tiny bits of apple throughout (I like to chop the apple really small so it blends in with the batter) and the wonderful fall flavors of cinnamon, nutmeg, and allspice (via some apple pie spice). There’s no butter or oil in the batter. Some sour cream gives the bread a rich, moist texture. The caramel glaze is a different story. There’s a whole lot of butter in that. But you can add a little or a lot of glaze to the bread. 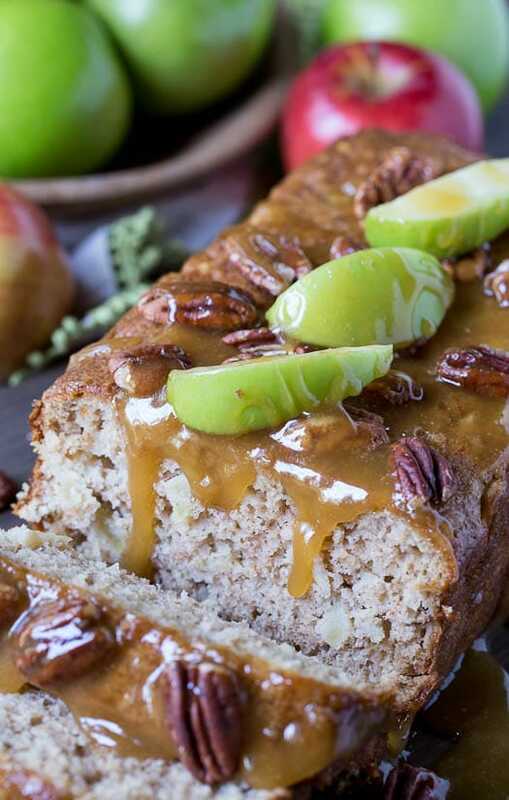 Caramel Apple Bread is great for snacking on or as dessert. You could even eat it for breakfast. I’m not one to judge. Preheat oven to 350 degrees and grease a 9X5-inch loaf pan. In a large bowl, mix together flour, baking powder, baking soda, salt, and apple pie spice. In another bowl, whisk together both sugars, sour cream, eggs, and vanilla extract until well blended. Pour wet ingredients into dry and stir until there are no streaks of flour. Fold in apples. Pour batter into prepared pan. Bake in oven for 50-55 minutes. Cool in pan 10 minutes and then remove to a wire rack to cool completely. In a small saucepan, bring butter, brown sugar, and whipping cream to a boil, stirring frequently. Boil for 1 minute. Spoon over bread and sprinkle with pecans. 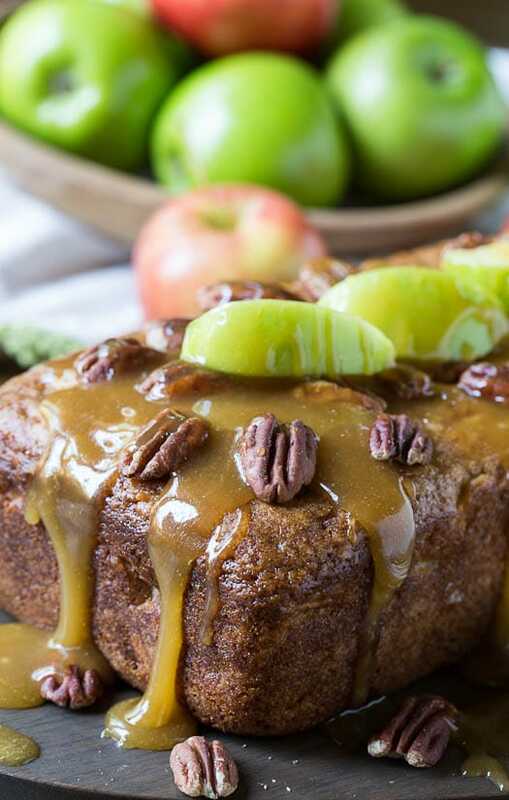 This entry was posted in Breads and Muffins, Cakes and tagged apple, apples, caramel, dessert brad, fall. Bookmark the permalink. Could gluten free flour be substituted?This sounds so yummy!I have Celiac Disease. Can you freeze this bread without the topping? I will be baking for an event December 1 and would like to bake this ahead of time and add the topping later. Hope you enjoy it Judy!! I have your bread in my oven as we speak. My kitchen is smelling AMAZING! One quick question, though… does this need to go in the fridge after baking? Wasn’t sure with it having the sour cream in it. Thanks a million!!! Hope you enjoy it Teresa! You do not have to refrigerate it. Oh wow, this bread looks so moist and delicious! The caramel sauce looks absolutely addictive – I’ll be surprised if even half of it ends up on the bread, rather than just spooned directly into my mouth! 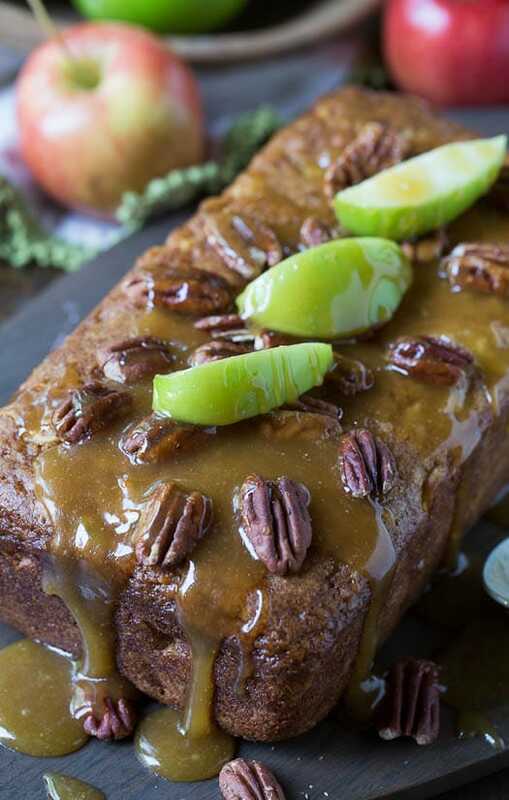 Oooh..that caramel lazily dripping down that spiced apple bread is sooo amazing. Yum!!! I am licking my screen! Girl that caramel drizzling down the side is seriously everything to me right now! 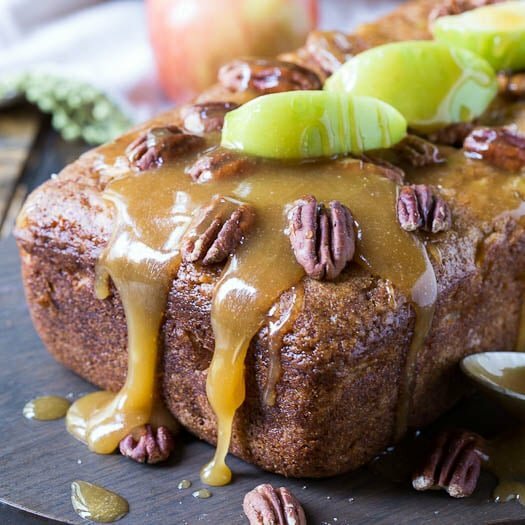 I so do love the smell of ” cinnamon, brown sugar, nutmeg, and ginger emanating from the oven” – just saying it makes me think I am smelling it as I look at this gorgeous caramel apple loaf!!! There really is nothing like fall baking! I love it. This looks absolutely delicious – and baking with sour cream is sooo good. 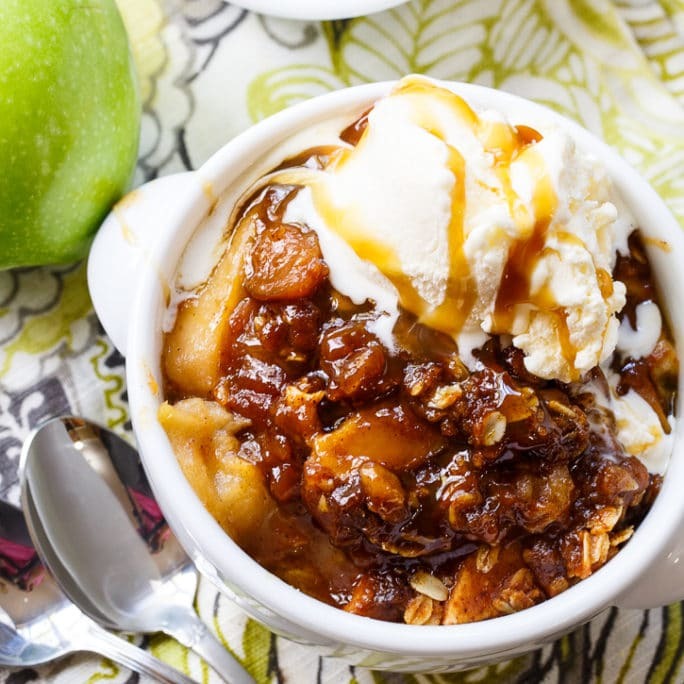 And that caramel over the top…. What a beautiful bread! YUM! The dripping sauce is my favourite part. Wow what a lovely bread! 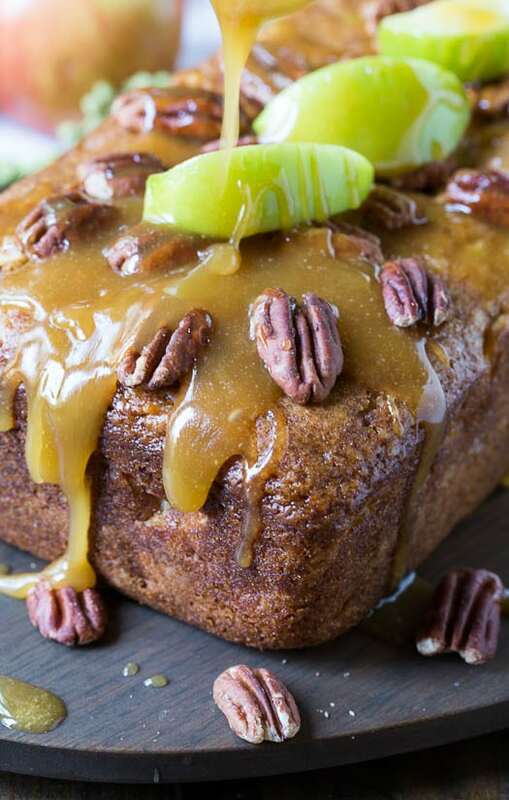 I just love the dripping caramel over the sides, I know my family would love this!